This option uses discreet, practically invisible brackets and tooth-coloured wires. The result is a more aesthetically pleasing look that is preferable to traditional braces that use metal brackets and wires. 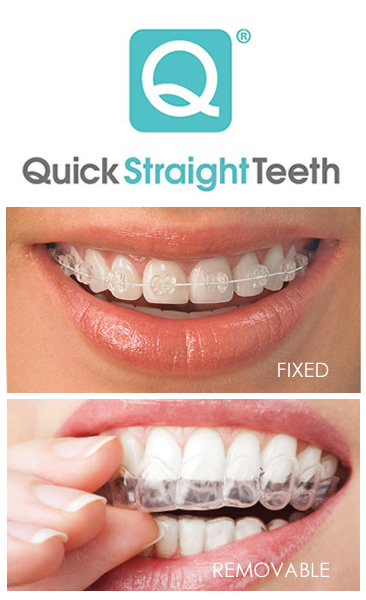 With the removable braces option, you’ll be given translucent alignment trays that use slight pressure to shift your teeth. You can enjoy eating all of your favourite foods and won’t have to worry about food particles getting lodged between your braces. Brushing and flossing are also much easier as you can remove the aligners first. Crafted with comfort in mind, QST braces feel great. They also are affordable thanks to low lab fees and shorter treatment times. With QST you don’t have to break your budget to get a straight, beautiful smile. Maybe you wanted to get braces when you were younger but just never got around to it. Or braces just didn’t fit into your budget. We help patients of all ages, including older adults, achieve a straight, confidence-boosting smile. If you’d like to find out if QST is an ideal option for you, contact us today to book a consultation! Your dentist will evaluate your teeth. If QST is appropriate for you, you’ll be given an estimate of the cost of your treatment. We’ll also let you know how long we think it will take to get you the results you desire.